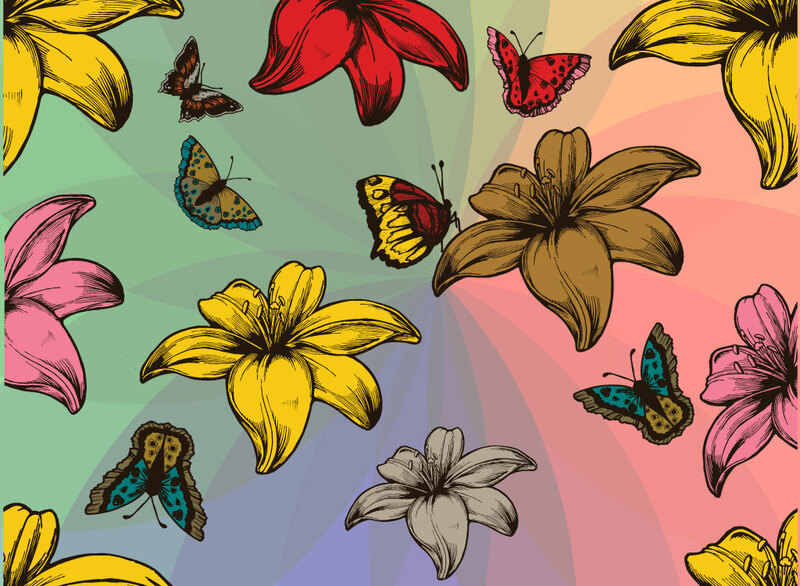 Vector pattern of tropical flowers and butterflies in high detail. Colorful and whimsical with black lines giving it that hand drawn feeling. Download this beautiful free floral stock footage for your nature themes, greeting cards and invitations or use individual elements to enhance your existing vacation, tourism, leisure time and paradise designs. Beautiful vector stock elements to design tropical patterns, unique botany, cute blossoms, blooming flowers, exotic flora, aloha, hibiscus, Hawaii, petals, macro nature, summer, flower shop, delicate flowers and beautiful nature graphics. Tags: Exotic, Flower Shop, Flower Vector, Garden, Hawaii, Hibiscus, Petals, Summer.